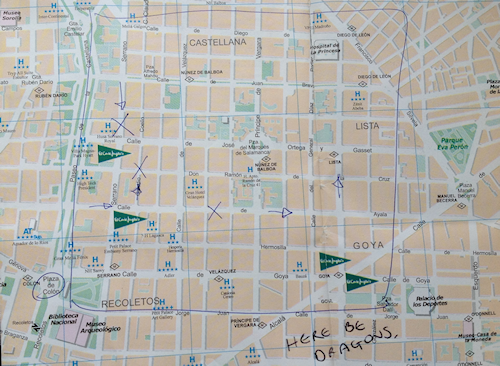 We're now at part three of our fascinating Condensed Madrid series and back in Madrid's Salamanca district after the day trip to Valencia. I missed my train coming back. What was that song that mentioned how beautiful they were the trains you miss? Not true. Let's take a stroll around. As you'll see above, the Herring Matisse loafers are enjoying the area too. 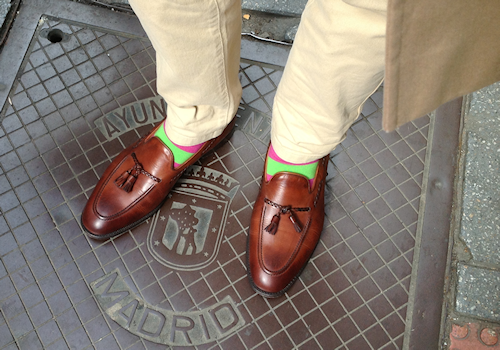 My Spanish friends say the English are afraid of colour, hence the defiant socks. The loafers also called for a narrow trouser, so as not to hide them. First of all, let's get you in a Teba jacket. 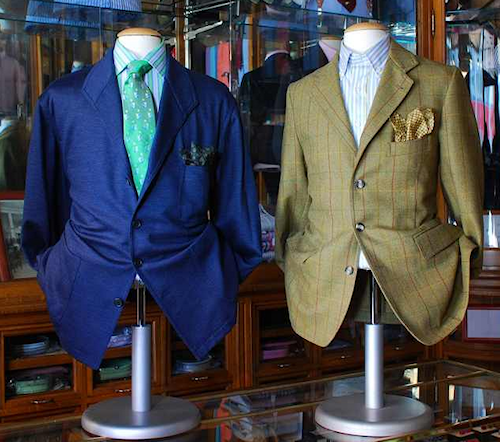 A Teba is an unlined and unstructured patch-pocket jacket/cardigan hybrid created by the Conde de Teba. Designed for hunting, but perfectly good for strolling and sherry sipping. You will see plenty of third agers wearing this style of jacket, but they seem to have fallen out of favour with the youth of Spain. Let's help keep this tradition alive. And when you've got you're Teba, why not call in at the very traditional Velásquez Hotel for a mid-morning drink where they're wall-to-wall. The tailors and outfitters above have all the trappings you need to accompany your Teba, but you will see many more as you wend your way around our square. You could also investigate other classic Spanish clothing styles at the Museum of Costume (Museo del Traje). This is outside our square. 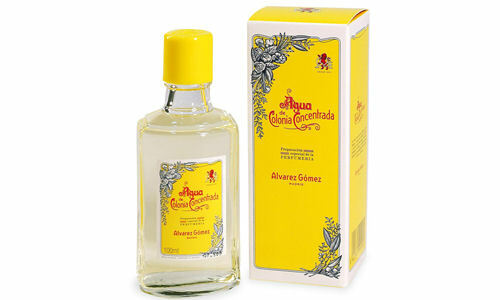 Okay, let's get you smelling like a Madrileno now. 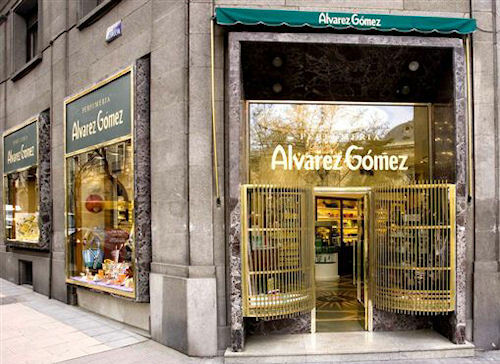 Call in at Alvarez Gomez's flagship shop in Serrano street and buy a ruddy big bottle of the classic cologne Agua de Colonia Concentrada. You'll be fresh against the heat of a Madrid summer. 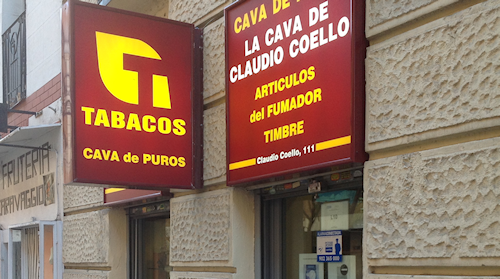 You will see a few Tabacos shops in the square with similar signage to the one above, which is La Cava De Claudio Coello. Excellent for cigars, the staff are very helpful and informative. Put a couple of recommended puros in the breast pocket of your Teba for extra Madrid points. If you insist on wandering from the square - and we will a bit more in part four - why not get your wig cut at El Kinze de Cuchilleros in Calle de los Cuchilleros? A traditional barbers and close to that Madrid institution Casa Lucio. Casa Lucio (and Botin) does great suckling pig, so tender it can be - and is - cut with a plate. Also try a bodega that sells vermouth on tap. Look out for the brands Yzaguirre, Cañí and Iris. Salud, Tweedy. John Lobb - But Which One?